It's been a nice, yet somewhat rainy week over here in SoCal. We were so disappointed when it started raining really hard the other day during our plans to go to Disney. It just wouldn't have been safe to make that drive on a Friday afternoon. I immediately thought that God must have something in store for us...another plan. Well, I was right because that evening Tiny B enjoyed chicken for the first time. She has taken tiny bites of it before, but then it just sits in her mouth. This time she ate about two ounces and loved it so much that she could have bathed in it, I think! She put her head back with every bite and dropped it in her mouth. There's just something inexplicable about watching a previously tube-fed child enjoy a new food. Yesterday I told her that I have seen a few miracles in her life, and one was watching her one-pound body when she was born. The other is watching her teach herself to eat. 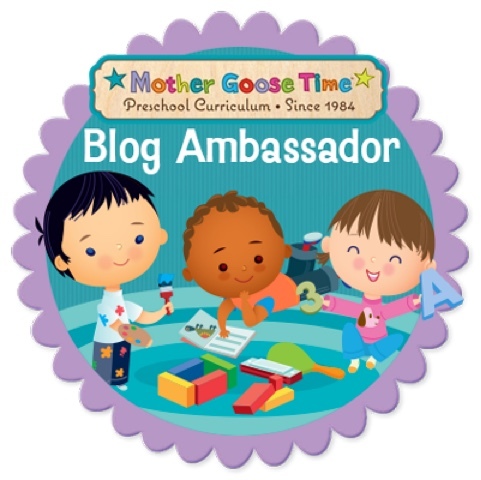 We started the Discover the Desert theme for March in Mother Goose Time. As usual, it's adorable. I'm not much of a cowboy, but my step dad is and has decorated his home with a cowboy theme, so we Facetimed him and has my mom take us on a virtual tour of the cowboy boots they have used as decor throughout the home. 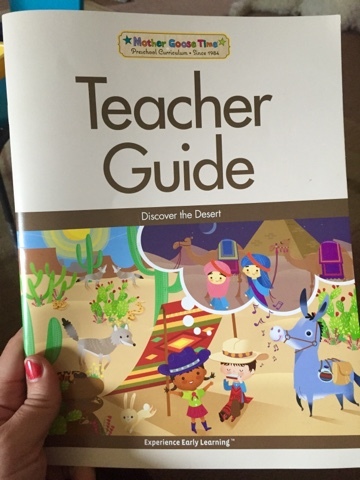 As you can see on the cover of the teacher guide, it's not only cowboys and cowgirls. It also includes the Mojave and Sahara desert, and desert nights. 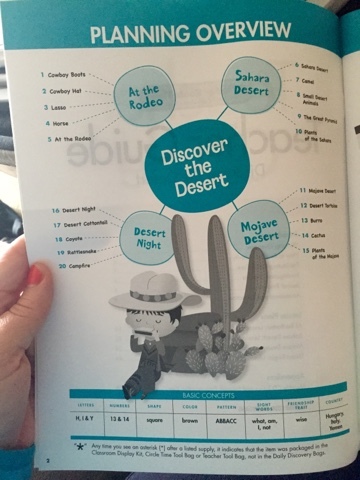 I love this page of the teacher guide, and I bring it with me to the library to help me find books to accompany the theme each month. I initially thought this month would be difficult when it came to finding books, but I was able to pull some together! 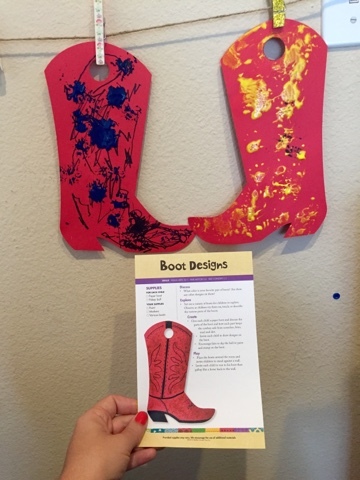 We started off with learning about cowboy boots (and our virtual tour) and made our own boots. 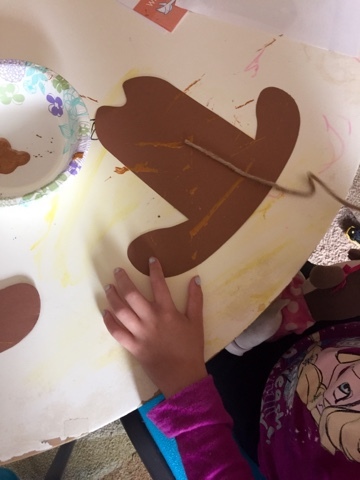 Once again MGT had the kids use the pokey balls to dip in paint, and then lightly touch them on the surface of the boot paper. Strong B is able to do this but for some reason Tiny B gets carried away and ends up smearing them. Ha ha! I liken it to when I'm doing a painting craft myself and am enjoying it so much that I overdo it. She also learned a very useful lesson which is that when painting, you can only paint one side at a time...The youngest grade that I taught was 3rd grade and they pretty much had that down by then, so I'm not used to teaching them these things that I don't even think about! Our theme poster magnifying glass search is always a favorite. I actually had misplaced the magnifying glass and I wanted Tiny B to find things in the picture without it, but she wouldn't have it. 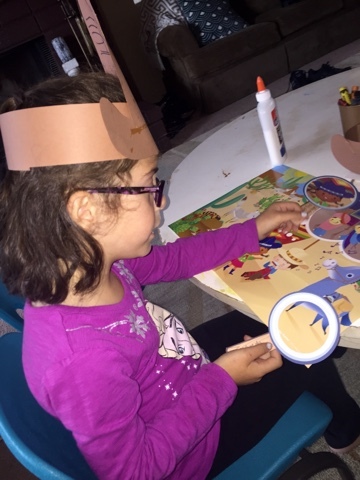 She loves those paper magnifying glasses. The theme poster is always a great jump-off for discussion and a great way to see the whole month at a glance. 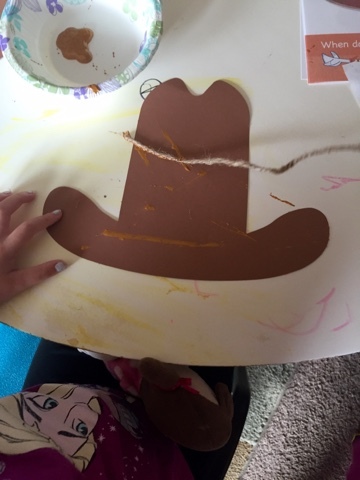 They used twine to drag across their paper cowboy hats. I love the different ways that MGT has us do art. I think this helps to instill in the child that they don't have to draw to create art, and this also creates confidence, because by a certain age we usually want to tell people that we "don't draw well" or that we "can color in the lines." I used a gold paint and it was gorgeous against the brown. On our day of learning about lassos, we tossed a cube with shapes made of lassos, and then identified and replicated those shapes on our own. 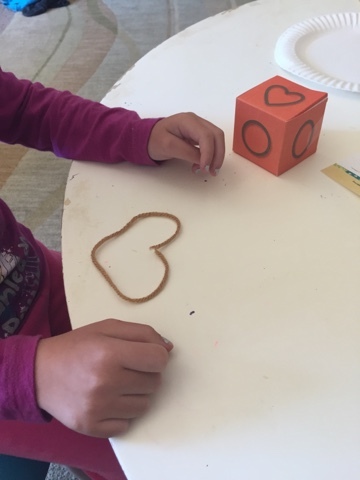 This is excellent fine motor practice and I'm always a fan of fine motor activities to learn shapes/letters/etc that don't use a writing instrument. 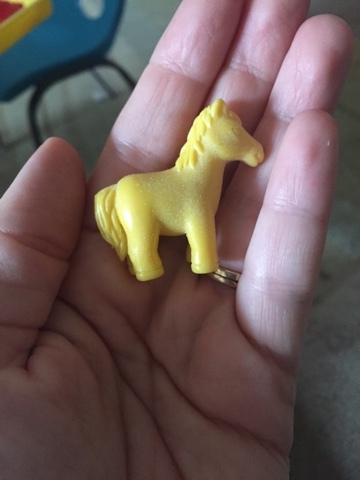 We got little horse manipulatives that look like this this month. 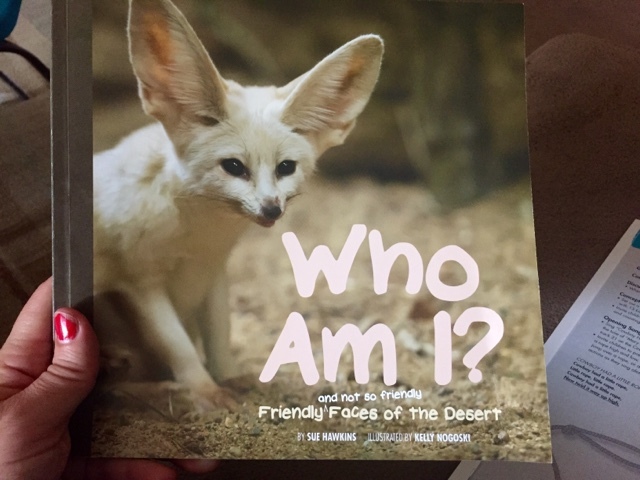 Absolutely adorable and perfect for keeping in our trays of sand to reenact scenes from the desert. This is the storybook of the month. I love that it's nonfiction. Nonfiction is often the most interesting to children but the hardest to read and understand. 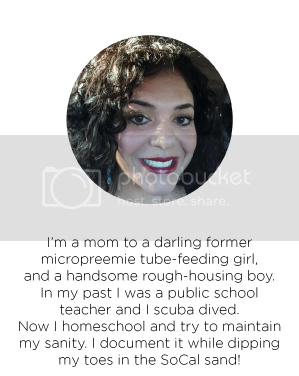 Schools have made it a point to read more and more nonfiction, so I love that we are preparing them for that in preschool. Last week we had a really gloomy day with rain. After the rain I looked out the window and saw a small piece of a rainbow. The kids weren't able to see it because it was very faint and then it disappeared and they were having difficulty seeing to where I was pointing. I was disappointed and had really wanted them to see it, even though it was tiny. 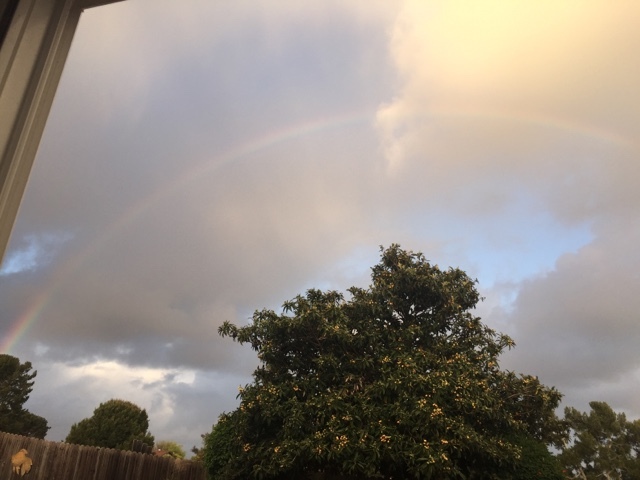 A few minutes later they were at the window and they said, "Look at the rainbow!" I came to look and was shocked to see it spread, bright and beautiful, across the entire sky! It had been there all along and I had only looked at the end of it. I hadn't even taken the time to look farther up. It was a huge illustration of how God's blessings are just gigantic and that we need to take the time to look for them. Or perhaps we only see small blessings that are nice in our lives but not amazing (we think) and need to look at the big picture.